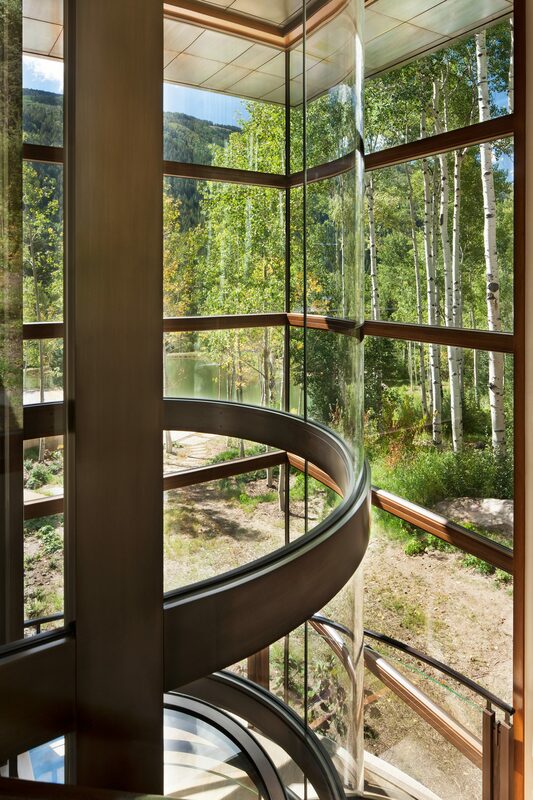 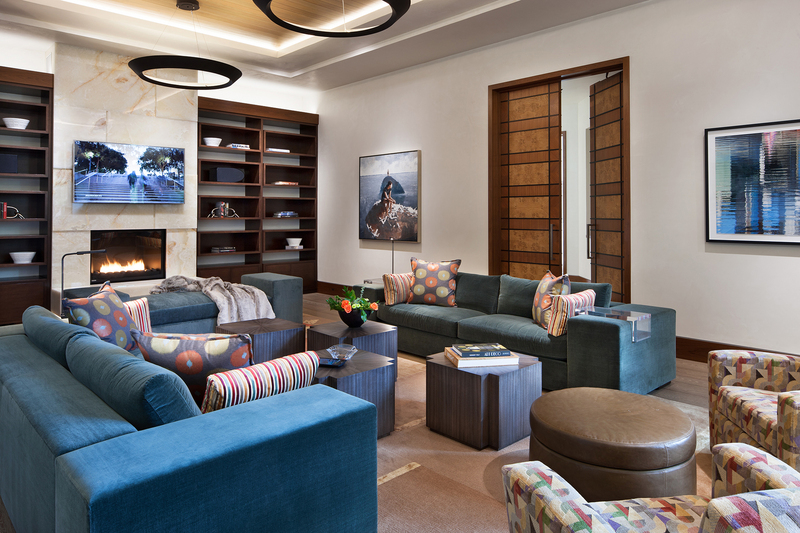 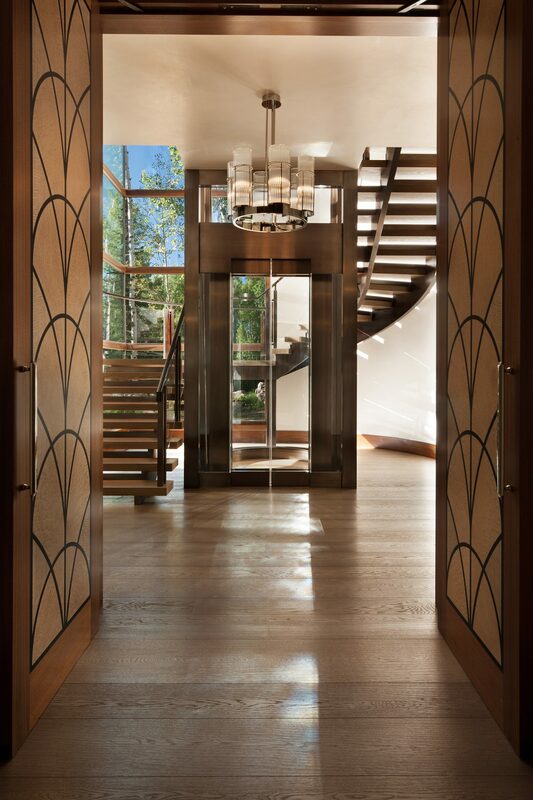 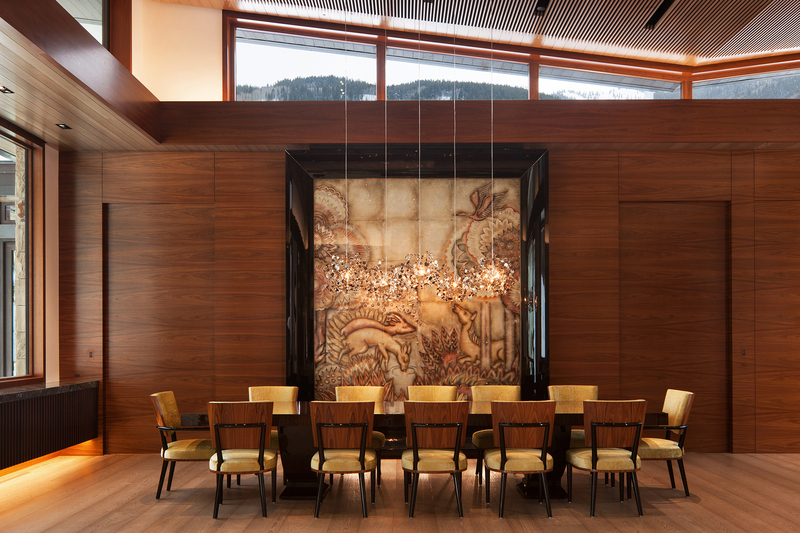 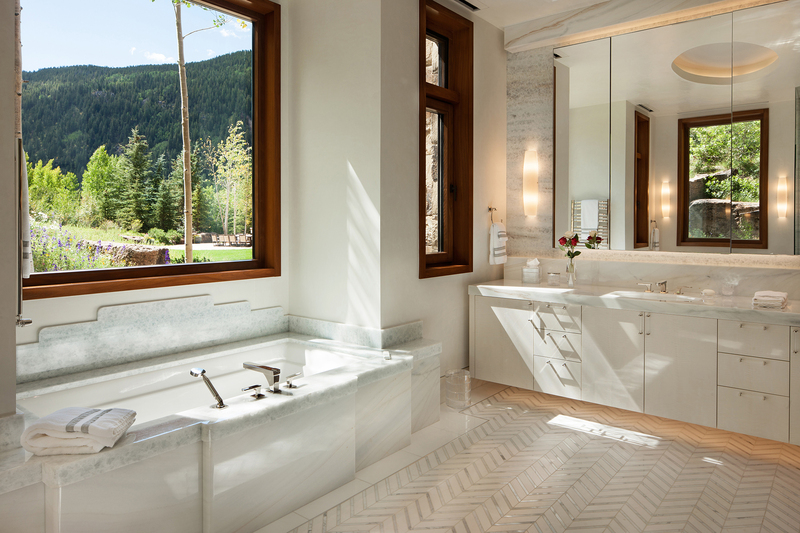 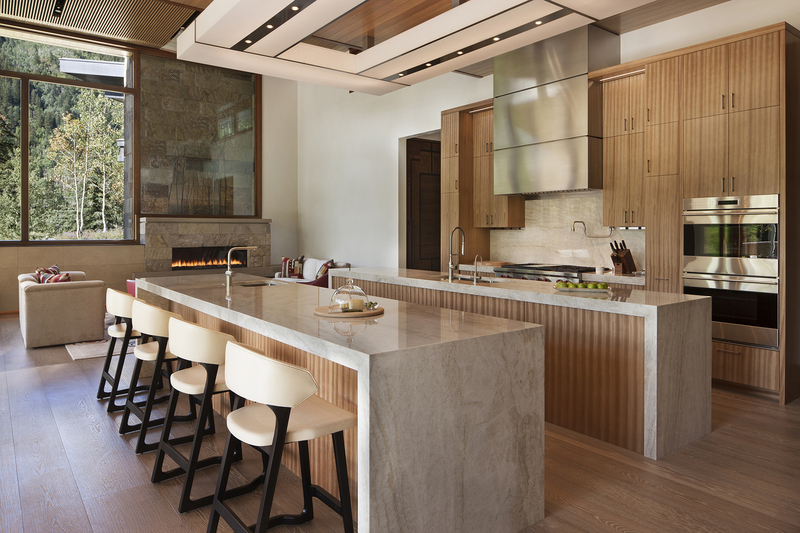 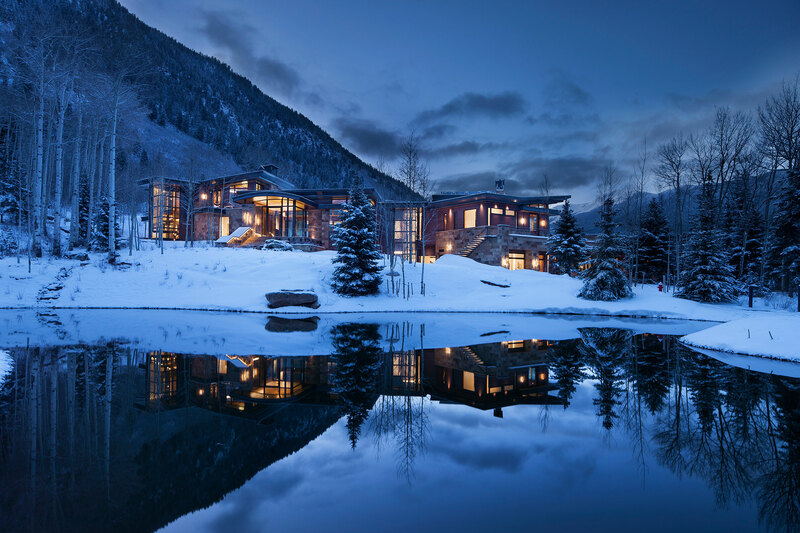 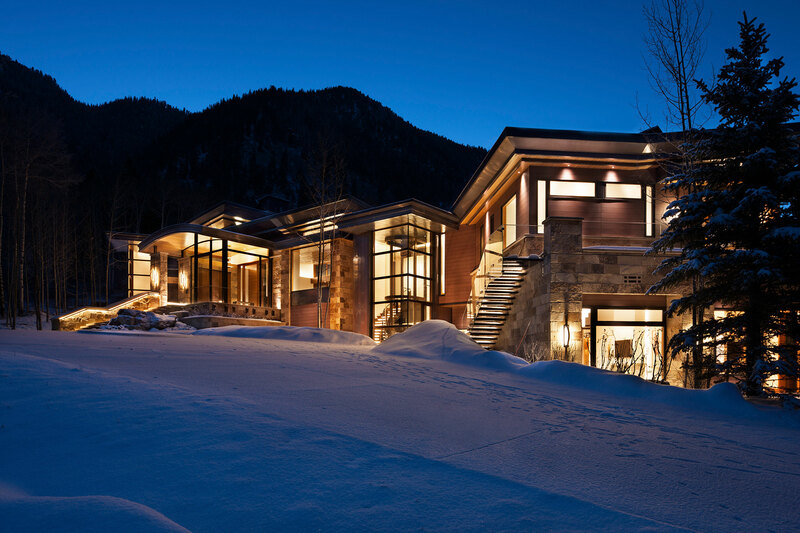 On a windswept rocky mountainside high above Aspen, the architects designed an environmentally sensitive, 15,000 sf, art-deco inspired contemporary home incorporating 36-species of wood. 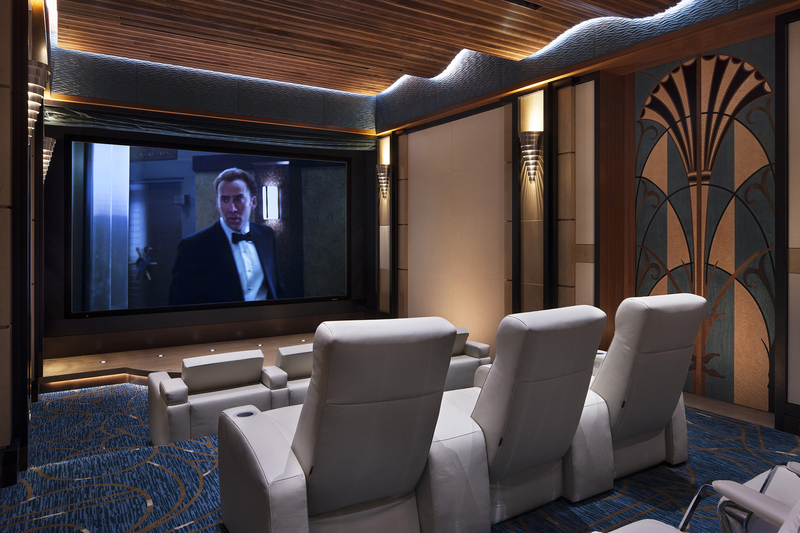 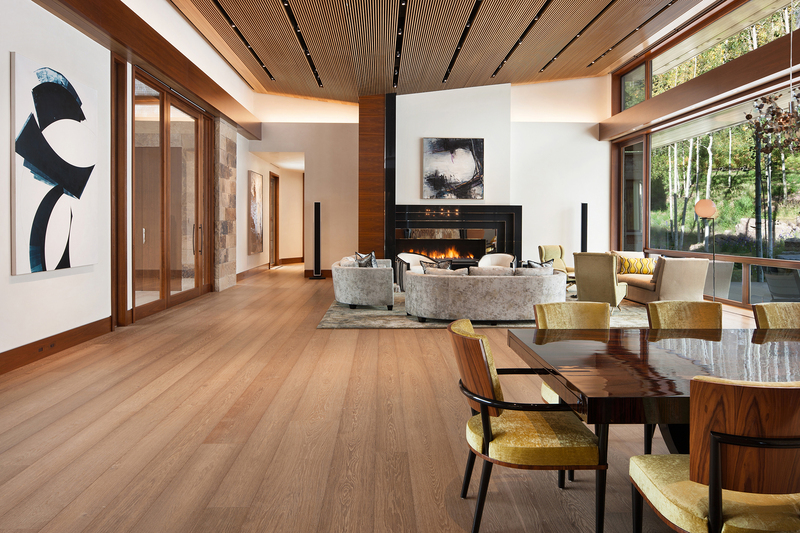 Lavish entertaining spaces, two glass elevators, a fully outfitted theatre and performance stage, the latest in home automation and HVAC systems, make this home truly unique. 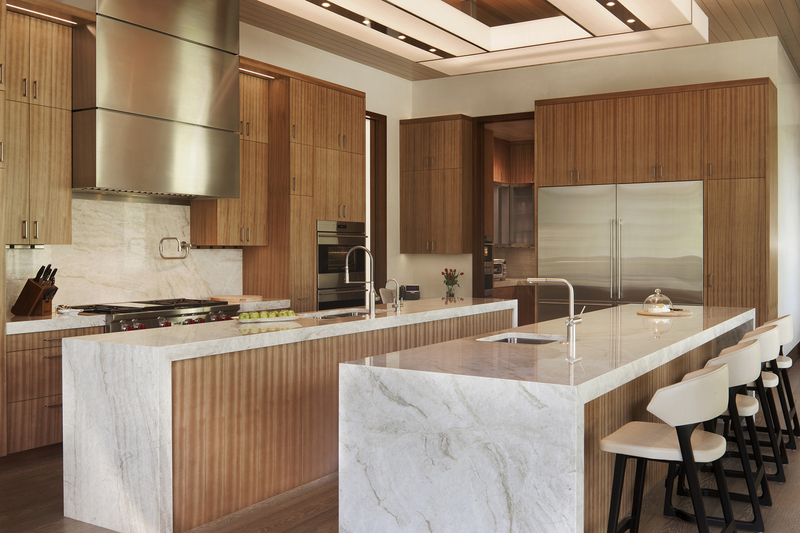 The challenge began on day one, when the Florida-based owners charged the architects to responsibly deconstruct much of the existing house, and design a home that fused art-deco and contemporary mountain-modern design. 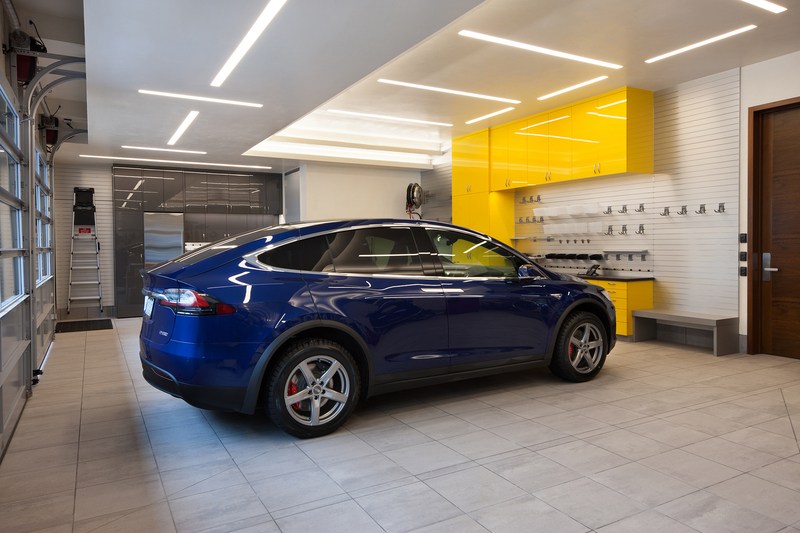 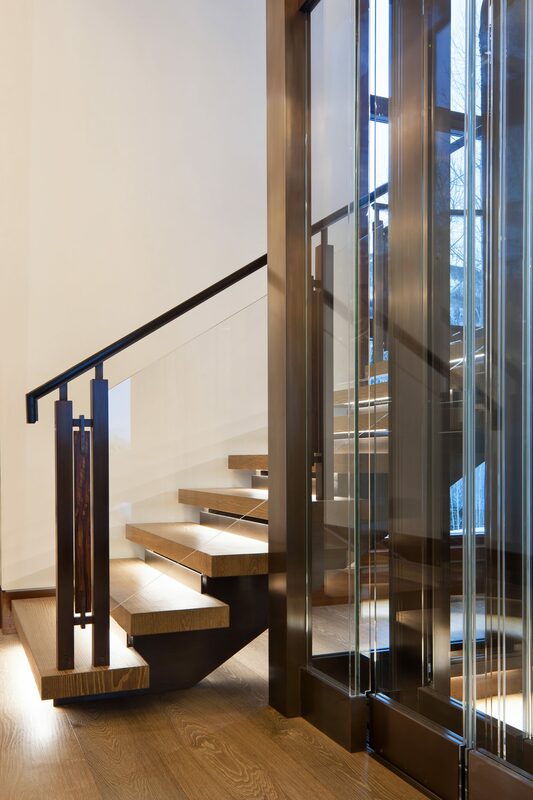 The site provided a very narrow building envelope which necessitated the 15,000 sf of living area, be split between three floors. 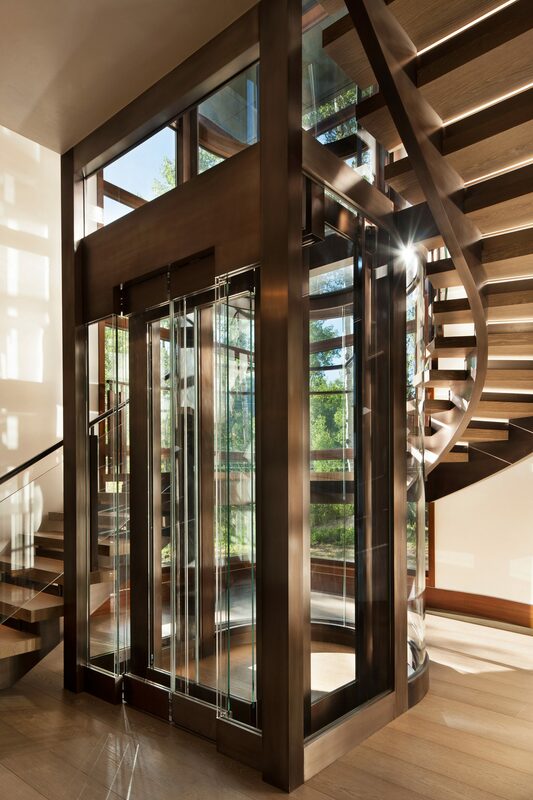 To access each floor, two steel and glass elevators with cascading wood staircases were seamlessly worked into the design. 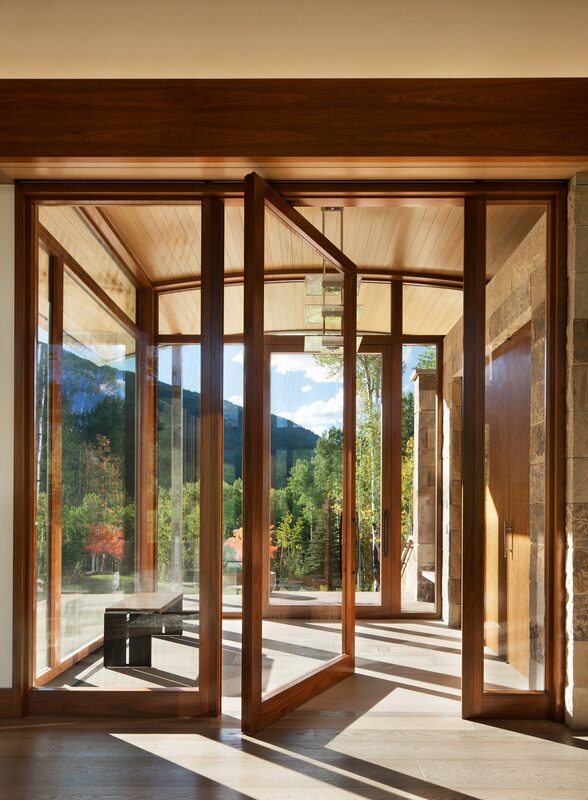 The exterior design pays homage to the surrounding mountain vistas, with varying roof angles, and use of stone and wood. 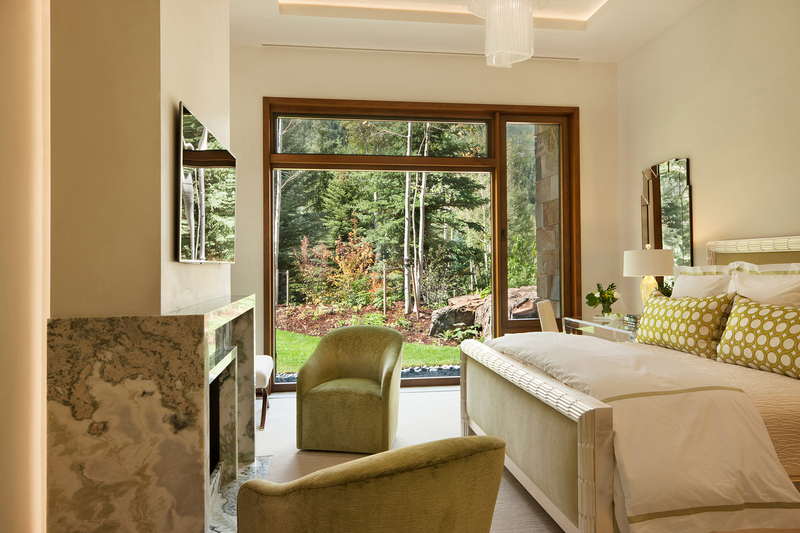 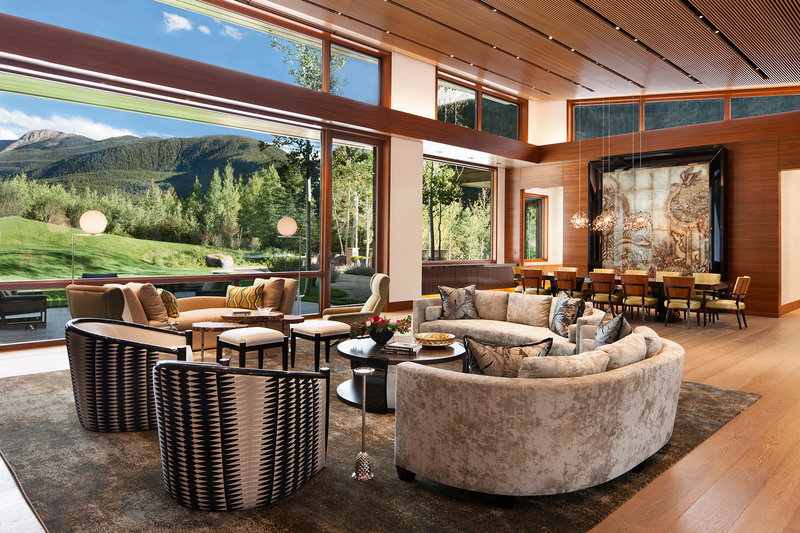 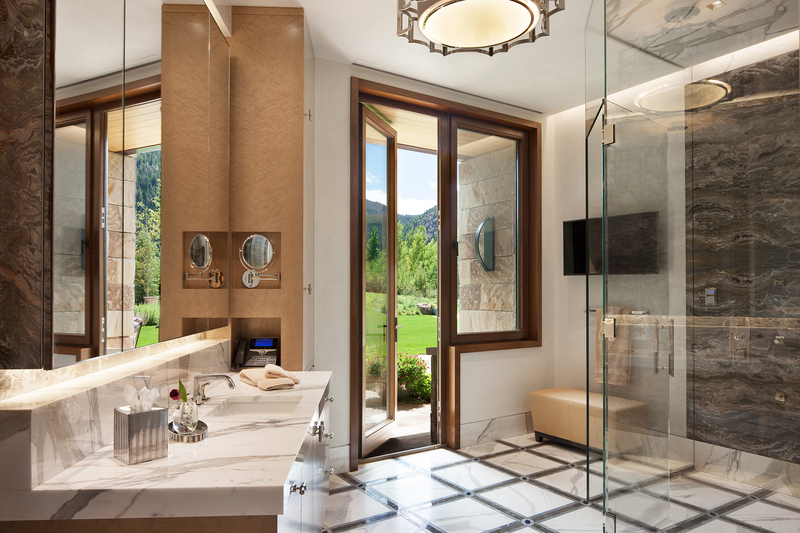 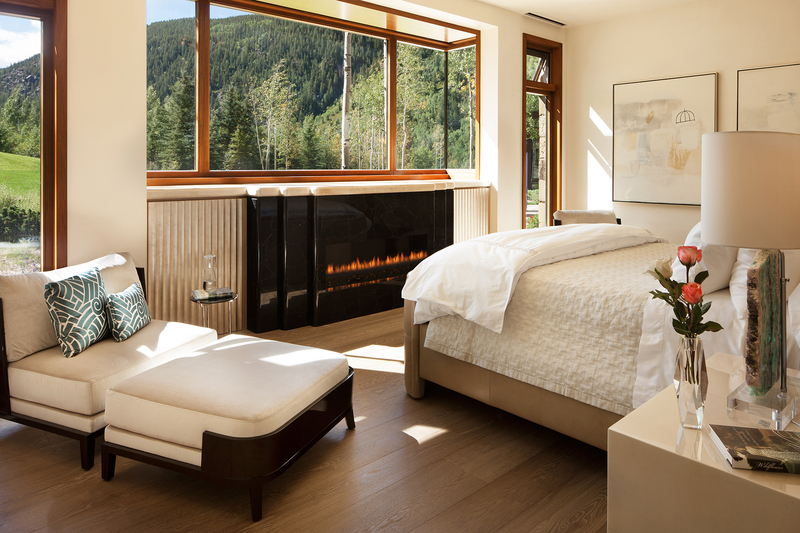 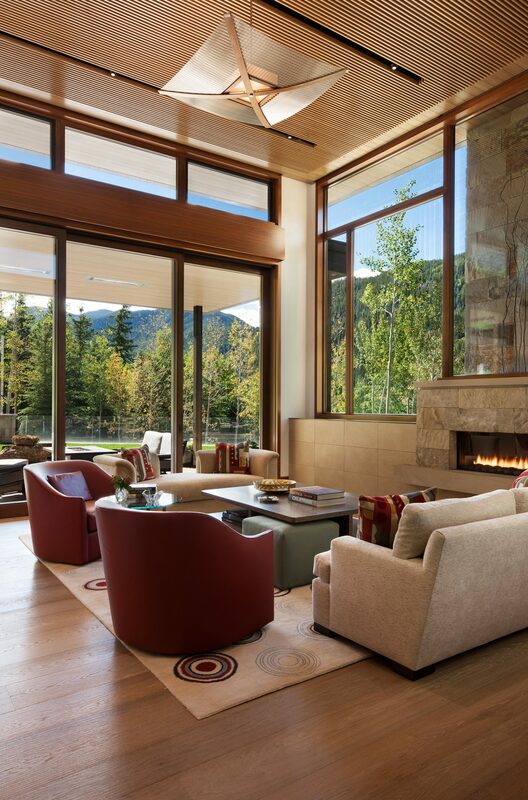 Massive floor to ceiling windows capture the unique views of famed Independence Pass and Aspen Mountain. 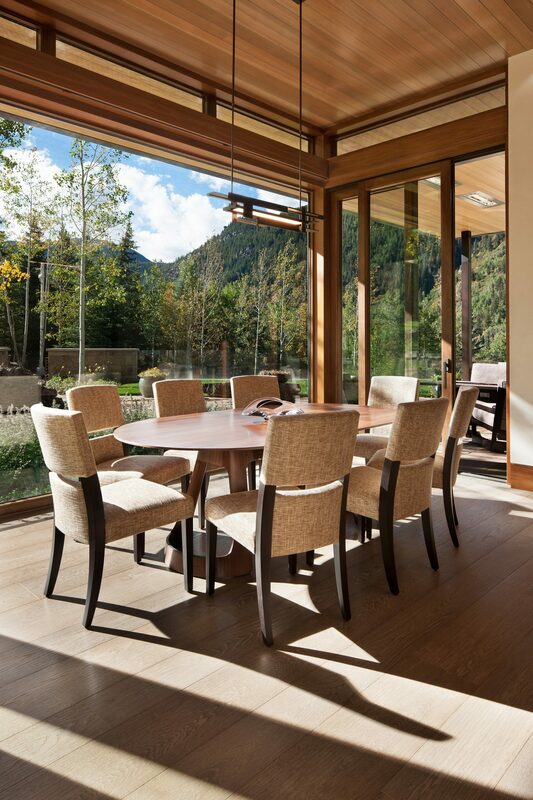 A glass pivot door opens the home, as views unfold through a window wall and clerestory windows in the great room and dining. 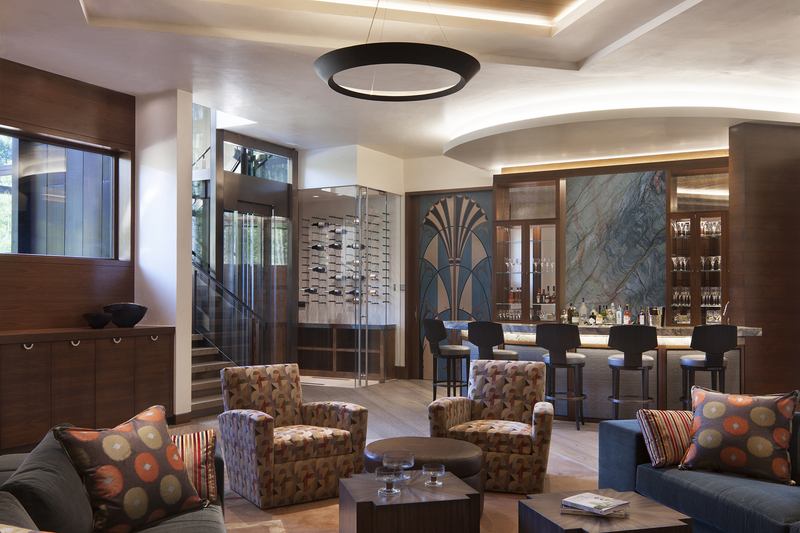 A Jean DeMerry mosaic mural sits between two automatic doors with views captured above, with a juxtaposed art-deco fireplace. 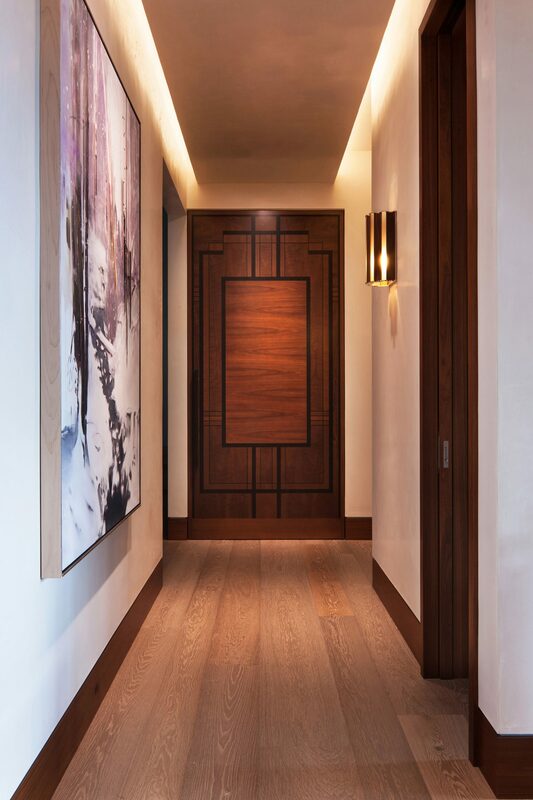 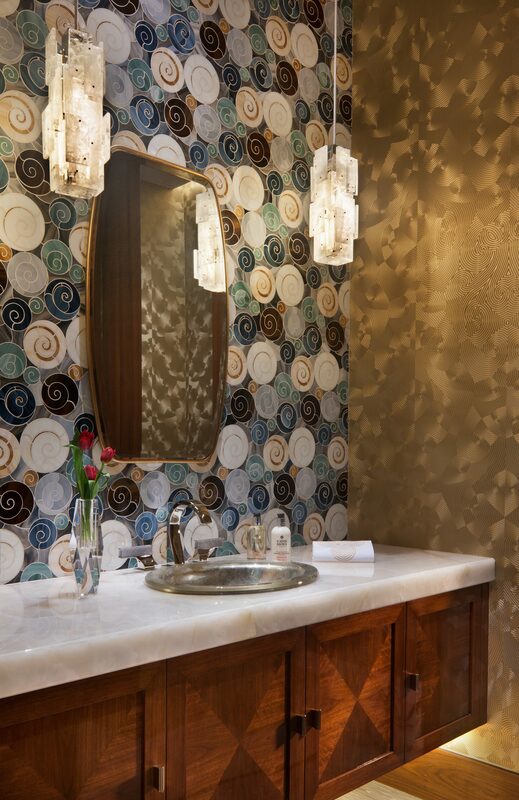 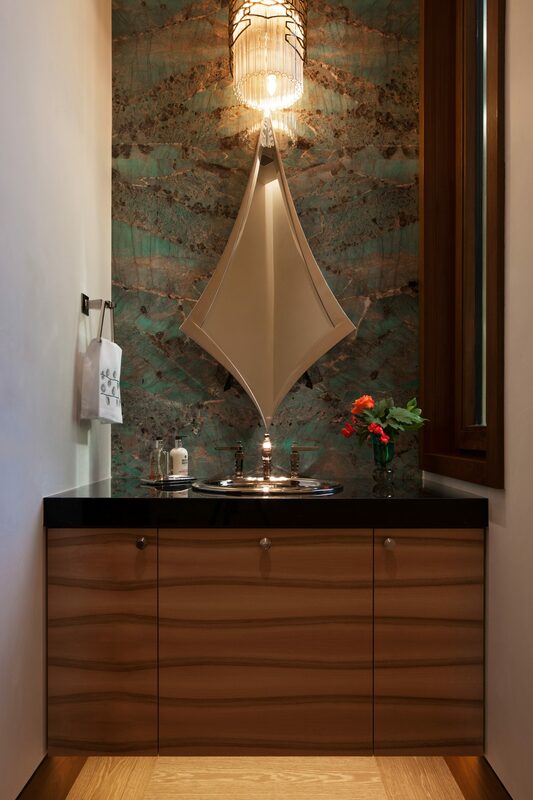 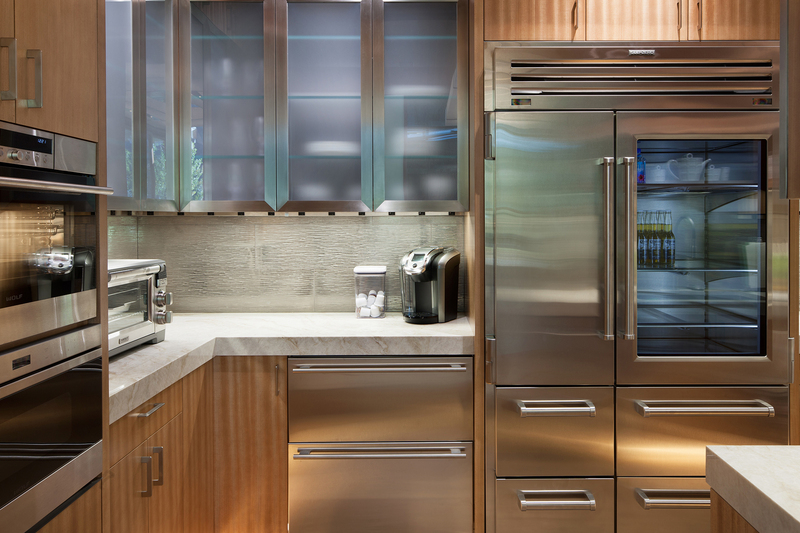 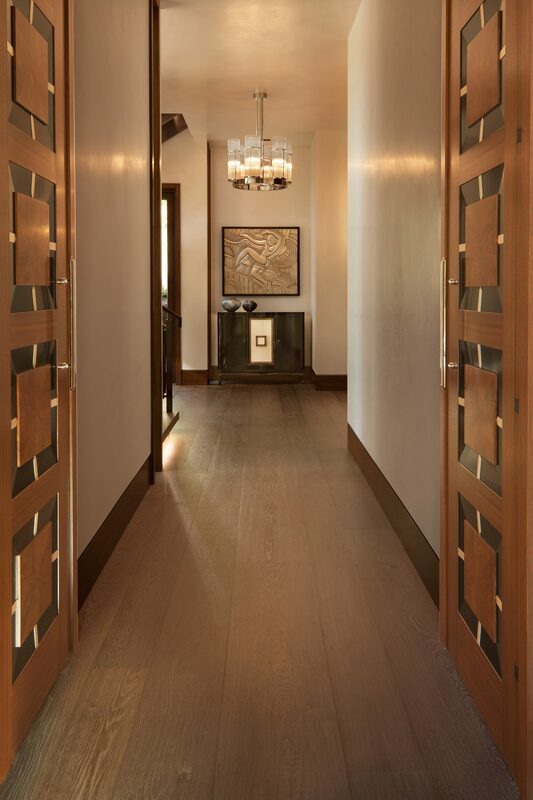 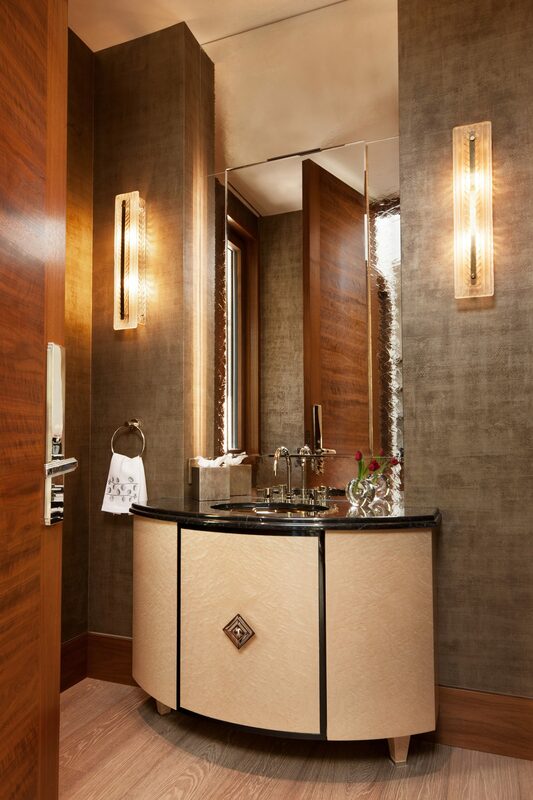 Custom designed wood-inlay doors are seen throughout the home, to further infuse the design inspiration. 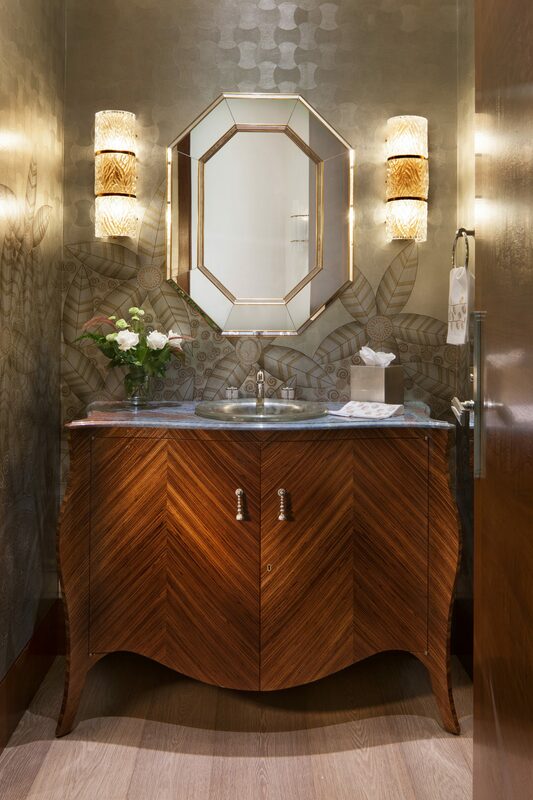 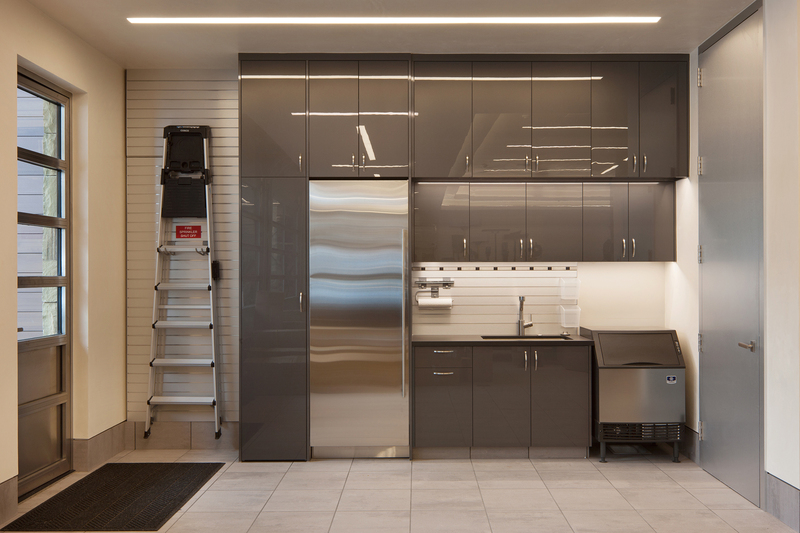 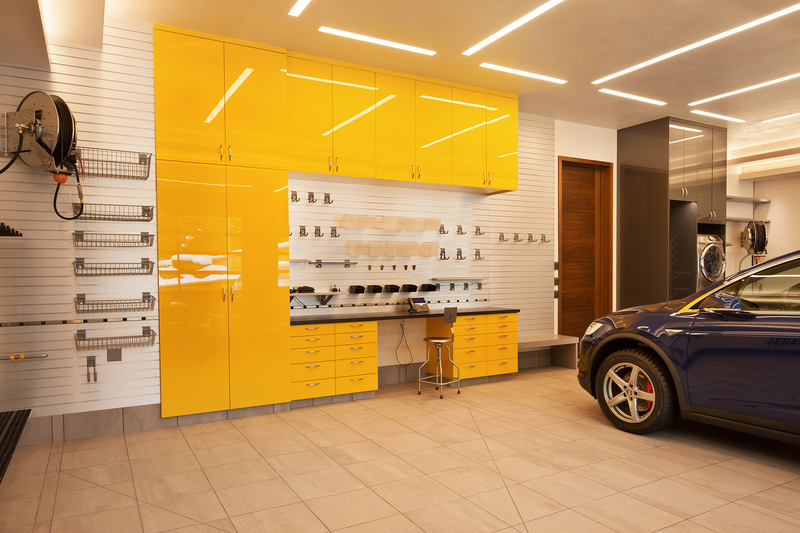 The team was careful to subtly instill the inspiration in parts of the home without overdoing it. 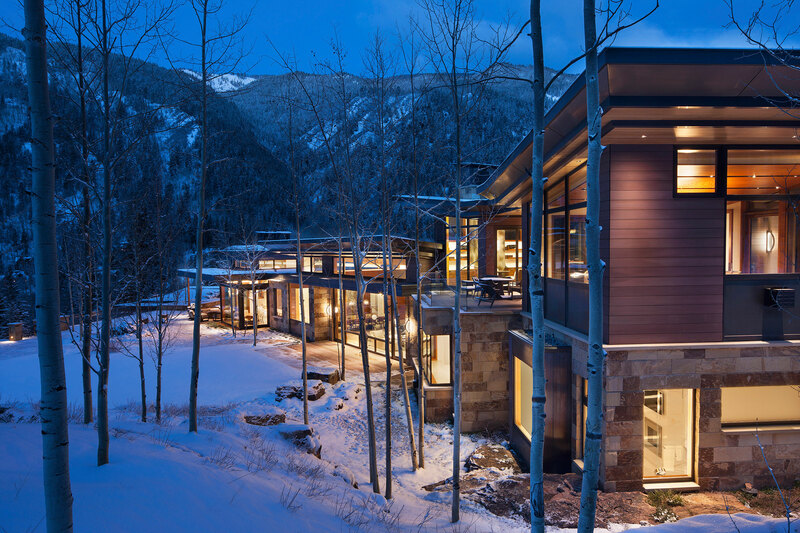 As the home cascades down the mountainside, its essence permeates the site and creates a wonderful entertaining home.